GROWING THE WORLD’S LARGEST WATERMELON (PART TWO): DOING A BEE’S JOB - What About Watermelon? 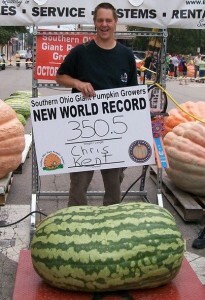 Chris has agreed to let me tag along with a series of blog entries about his 2015 crop and chronicle his efforts to break that world record. 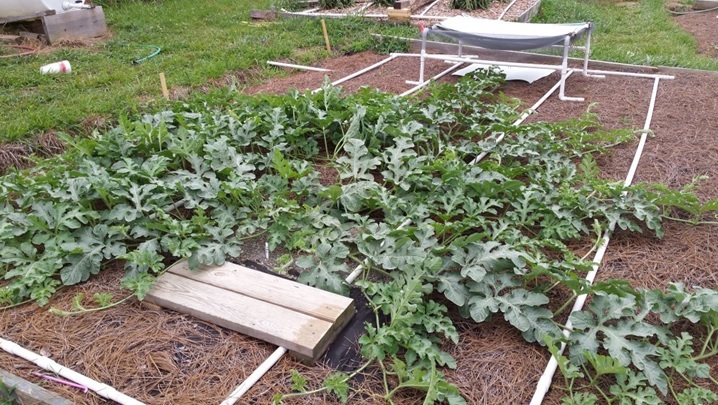 A lot has happened in the past 30 days, and the watermelon plants have grown from a few tiny sprouts to a series of sprawling vines that are slowly taking over Chris’s backyard. There are currently 10 plants that Chris is focusing his attention on. This past weekend, Chris started pollinating the flowers on the plants. Pollination usually occurs naturally by bees, which transport pollen from a male flower and spread it to a female flower. Championship watermelon growers like Chris, however, hand pollinate the flowers so that he can use pollen from only the highest quality male flowers. 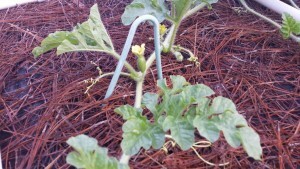 The pollination process has begun on some of Chris’s plants, but not all of them. In the meantime, there’s plenty of daily upkeep. Chris trains the vines to go in various directions. “I don’t want them all bunched up,” said Chris. “I like to spread them out.” If there’s no rain and the weather is hot, the plants need to be watered daily. A full grown plant needs 20 gallons of water each day, in addition to plant food and soil amendments. In next month’s blog entry, we’ll discuss how Chris keeps rabbits, mice and other critters away from his plants. We’ll also talk about how he determines which watermelon have Guinness potential, and which ones to cut off the vine to give the biggest ones the best chance at becoming the next world record-holder.